Has any filmmaker shown mastery in more genres than Howard Hawks? Sixty years ago today, Hawks released one of his best Westerns (not a motel) in Red River, which also gave John Wayne one of his best roles and Montgomery Clift a notable early screen appearance. 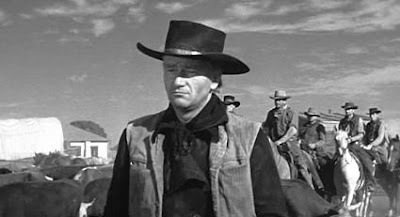 Hawks made other great Westerns (most notably Rio Bravo, which also featured Wayne and Walter Brennan), but Red River, despite its abrupt climax, remains my favorite with its tale of a long cattle drive, surrogate father-son conflict and unmistakable gay subtext. Wayne admittedly was a limited actor, but he always was at his best when he played a character steeped in darkness and obsession such as Thomas Dunson here or Ethan Edwards in John Ford's The Searchers. He's helped immeasurably by getting to act opposite the young Clift, the antithesis of acting style when compared to Wayne. Hawks' direction of the film itself truly amazes, especially in the many scenes of the huge numbers of cattle, all done in the days without the easy out of CGI (A scene of the drive even earned a shoutout in Peter Bogdanovich's great 1971 film The Last Picture Show). He also manages to include plenty of his trademark humor, mostly through the ensemble of supporting character actors led by Brennan (whose character loses his false teeth in a poker game) and including Hank Worden (the decrepit waiter in Twin Peaks for those unfamiliar with the name) who gets plenty of throwaway lines such as how he doesn't like when things go good or bad, he just wants them to go in between. Hawks even manages to toss in what may be an example of the ultimate Hawksian woman with Joanne Dru as Tess Millay, who doesn't let a little thing such as an arrow stop her from nagging a man with questions. Hawks astounds viewers to this day with his versatility among genres: Westerns, screwball comedies, musicals, war films, noirs, sci-fi — pick a genre and Hawks probably took it on and scored. It's a mystery to me why his name isn't brought up more by people other than the most obsessive film buffs. Red River isn't my favorite Hawks, but it's one of his many great ones and continues to entertain after 60 years. 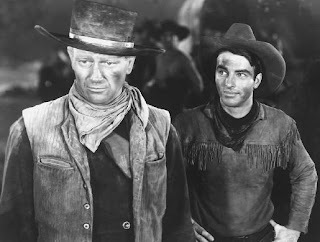 God, I love Walter Brennan in this. Where have all the side-kicks gone? The first glimpse I had of Red River was the clip of John Ireland calling out to a focused John Wayne at the climax of the film. Wayne, without breaking stride, turns and shoots him and Ireland shoots him back. I saw it on a big screen in the Buckminster Fuller dome American exhibit in Montreal at Expo 67. The screen was above a Claes Oldenbourg giant soft fan sculpture. I came back to see that clip a couple more times. Sure emblematic of a certain kind of Americana.